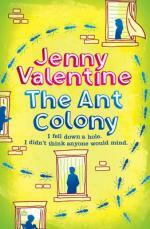 Four extraordinary stories from Guardian award-winning author, Jenny Valentine. "e;Valentine writes so beautifully and so convincingly that you're instantly swept into the mystery of people's lives. "e; Amanda Craig, The TimesFinding Violet Park:When sixteen-year-old Lucas Swain rescues Violet Park's ashes from a mini-cab office, he sets out to discover who she was, and finally faces up to the question of his missing father...Broken Soup:When a stranger gives a dropped photo negative to Rowan, she's sure it's all a big mistake. Who is he? Why did he give it to her? The mystery only deepens when the photo is developed and the inconceivable appears.The Ant Colony:For Sam and Bohemia, number 33 Georgiana Street is a place to disappear. Like ants, the residents scurry about their business, no questions asked. But it doesn't take much to upset the balance. Dig deep enough and you'll find that everyone has something to hide...The Double Life of Cassiel Roadnight:An explosive mystery and the story of a boy who assumes the identity of a missing teenager and in-so-doing unearths a series of shattering family secrets - and the truth about who he really is.